Hi folks. Over the past couple of weeks we’ve had crazy amounts of feedback about our New England style IPA “So Hot Right Now”. Some drinkers have reviewed it as their all-time favourite UnBarred beer. However, you may also have seen a few images of bad cans on social media, and we know that it’s not acceptable for our customers to be drinking beer that isn’t up to scratch. 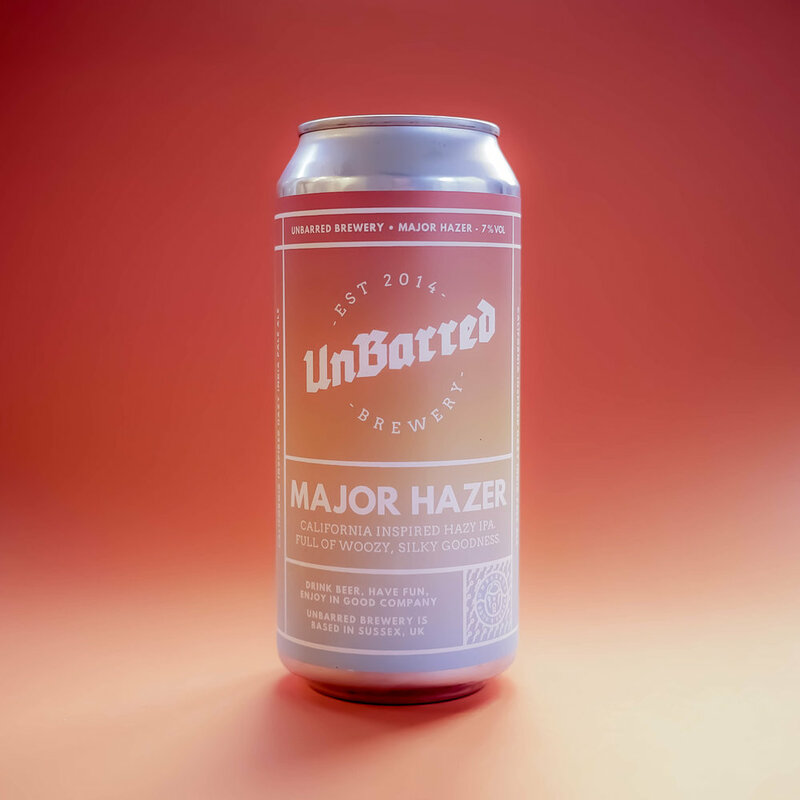 At UnBarred we always aspire to be as open and honest as possible about our brewing ethos and process, so we’re letting you know the story of what has gone into this beer, what might have caused some sporadic problems, and what we will be doing differently in the future to make our beers even better. If a bit of beer geekery isn’t your bag, then please just skip to the last section ‘Going Forward’. As always, thanks for your support and feedback. We couldn’t do this without you all. So Hot Right Now is a very hazy New England style IPA with big tropical notes of passionfruit and mango. A super silky mouthfeel with low bitterness. For the base of this beer we need a lot of protein and it’s very common to add a lot of oats and wheat to achieve this. We back this up with a low attenuating yeast (that eats less of the sugars) so as to get even more of the soft mouthfeel we are trying to achieve. For minimal bitterness and lots of flavour and aroma we add high doses of big oily hops during the end of the boil and during fermentation. Fermentation hops add a different dimension to the flavour profile you achieve when dry hoping solely at the end of fermentation, but it brings with it some extra risks. For this style in particular we don’t cut any corners in choosing big expensive hops and using as much as we can to achieve our goals. 5 days after the beer was canned and kegged, we got one report of an oxidised beer (brown in colour, low hop aroma and sweetness). We instantly replaced the can and tested the cans from the rest of the case to find no other cans were affected. We then did a lot of backtracking over processes and initially concluded it was a random can. Over the last few weeks though we’ve had 6 more reports of the same issue and noticed the common feature in affected cans is that they hadn’t been refrigerated from cradle to grave. So we experimented with heating cans up to 30°C and held them there to speed up any possible oxidisation. The results show that if the cans are held in a high temperature for a long enough period, then they will eventually prematurely oxidise. It seems as though the hottest summer on record for decades has meant a few cans have gotten too hot before reaching their drinking glass, making for a spoilt beer. The benefit of un-filtered and un-fined beer is the full flavour of all the ingredients that have gone into that beer are still there for you to enjoy. This is something we always wanted to promote. But there is a reason the big guys strip out yeast and dry matter and that is to help stabilise the beer and increase shelf life. However, sometimes the mixture of methods that are used for New Englands can lead to more yeast and protein ending up in the can, along with the polyphenols from the high hopping rates. This can create an interaction that speeds up the oxidisation process, hence the occasional bad can. At Missing Link Brewing (our laboratory|kitchen|recording studio), we have been fermenting, sounding and conditioning our beers in single vessels to reduce oxygen pick up. Our cans are a very low 20-50ppb and having spoken to loads of brewers in the industry, they would all be happy with this result. The cans are leaving the Brewery in good shape, but we know that its our responsibility to make sure that they reach you in tip top condition, and are really sorry if you’ve unfortunately received a sub-standard beer. We pushed the boundaries really far with this one but the science bit back. Life never sits still at UnBarred. A whole load of new kit arriving this month and our massively exciting new brew house starts its installation this week. Once it’s all complete, conditioning tanks will take the beer off the yeast pre-packaging, a new can rinser will be used (even though cans are delivered sterile), a centrifuge will reduce the yeast and debris, and a hop gun will decrease hop debris left in the beer but increase flavour and aroma. All of these processes are taking place right now, and we are genuinely excited to see what new opportunities the new gear will open up for us. We will keep pushing boundaries with our beers and stay true to the ethos of being “UnBarred” in our recipes, techniques and beers. With So Hot Right Now we have learned lots from the experience, but promise not to play it too to safe with future beers and will continue to share our journey with you all. We hope you keep enjoying the beer with us and will let us know if you’ve had any issue with So Hot Right Now. If you have had a bad can, get in touch with us or your retailer, and we’ll make sure you get a fresh and tasty replacement in your hands asap. Otherwise, drink beer, have fun and enjoy in good company. Cheers guys. As all UnBarred drinkers know, we love working with fruit and hops to create big and bold new beers. Back in the distant mists of time when we first started out as home brewers we made a couple of SMASH (single malt and single hop) beers. They were a great way to develop our understanding of how ingredients work, but on their own SMASH beers could be a little one dimensional. So we decided to take the core idea of SMASH beers and give it our own UnBarred twist: welcome to the Single Hop, Single Fruit range, or SHSF. With this series we've decided to use a combination of the best ingredients we’ve played with before and showcase them in the purest and punchiest way possible. All the malt bases are similar, using oats and wheat for softness and a pale ale base malt to showcase the hops and fruit. The hops all have an aspect of the fruit pairing and the beers will have roughly the same volume of hops with similar edition times. We were honoured to be part of the farewell tour of our great friends at the Little Blue Smokehouse last week. Friday night saw a fantastic 'Best of Both' evening hosted by the brilliant Be Fries at West Street in Brighton, where LBS went out in a blaze of meaty glory, with each course paired with one of our beers. First course was paprika fries loaded with BBQ pulled pork, topped with pickled apple and chilli. Our OPA went down a treat with that one. Next up was the massive beef brisket with cheesy fries and mustard glaze, accompanied by our classic 3Bs. We had to have the Brighton beer on home turf! Last up was cinnamon fries (that's right, cinnamon fries) with a coffee mousse and unforgettable chocolate bacon! Our cryo-hopped Porter was the perfect dark match for that insane pudding. Incredible food matched with a few tasty beers made for a huge hunk of BBQ heaven! This is what it's all about for us at UnBarred. Good food. Good beer. Good company. If you're interested in a similar collaboration in the future, give us a shout! Here at UnBarred, Santa's elves have got nothing on us! For Advent we've released a couple of monstrous new beers to help ease the count-down to Christmas through those long winter nights. First up is the Tropic Soda; a New England style beer with a massive tropical hit of passion fruit, pineapple and mango puree, balanced out with Citra, Azacca, Mosaic & Idaho 7 hops. Coming in at a hazy 5.8%, this one is guaranteed to bring a blast of sunshine even when it's dark and cold out. Next is the Stoutzilla, an old favourite that you can expect to see roaming the streets every year at Christmas. It's a beast of an Imperial Stout, brewed with crazy amounts of chocolate malt, lactose, Bramling Cross hops and muscovado sugar in the mash. It's finished with a glug of bourbon, lots of Madagascan vanilla and dark fruity coffee from our friends at Lindfield Coffee Works who blended a bespoke coffee just for this brew. The special can design features an incredible scratchboard image of Stoutzilla terrorising the Brighton Pavillion, courtesy of the outrageously talented Paul Jackson.